Kamal Mangal, the uncle of Attorney General Anil Nandall, who became a remigrant almost two years ago, has said that he was not aware that he had to be living in Guyana to qualify as a remigrant. 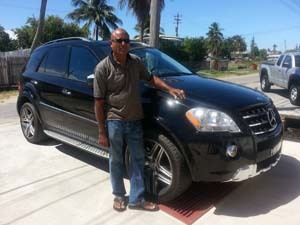 Remigrant, Kamal Mangal with his Mercedes Benz SUV. He has also denied that he did anything wrong when he used the Attorney General’s home address to apply for remigrant status which allowed him to import a high-end Mercedes Benz Sports Utility Vehicle (SUV) and other personal items as a remigrant. The vehicle, parked at a Delhi Street, Prashad Nagar apartment complex compound, is sometimes used by the caretaker, Mangal claimed. Kamal Mangal, who told Kaieteur News that he was 60, (Mangal is actually 67) came into the spotlight last week after a report in Stabroek News which said that state investigators focused on Nandlall while it was investigating a duty free racket under the Remigrant Scheme. Speaking with Kaieteur News on Tuesday, Mangal said he lived in the US for over 30 years and was originally from Black Bush Polder, Berbice. He flew in recently. Mangal admitted that he has been coming regularly to Guyana, but after applying for remigrant status, he never spent more than one month in the country. On most occasions he spent a few days. In Florida, where he has homes, he has been investing in apartments, renting them to tenants. In Maryland, he operates an auto body workshop. Within the last few years, he has been visiting Guyana more regularly. As a matter of fact, said Mangal, he had partnered with Nandlall to purchase the South Road offices which eventually house the law firm offices of the Minister. About two years ago, in August 2012, with intentions to come back to Guyana, Mangal said he applied to become a remigrant. It was granted by the Ministry of Foreign Affairs. He was granted permission by the Guyana Revenue Authority to have the necessary waivers on taxes. 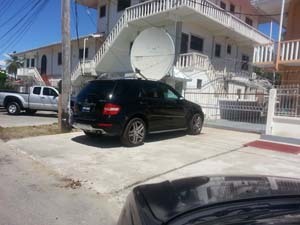 On the application, Mangal said that he listed his address as the Minister’s residence at 55 Chandra Nagar Street, Prashad Nagar, as that was where he would stay when in Guyana. Mangal said that his Tax Identification Number (TIN) was registered at the time of application to Nandlall’s address. Asked whether his family was also part of the application for remigrant status, Mangal said that his family still resides in Florida. The businessman, making it clear that he has workers managing his apartment business in Prashad Nagar, said that the application had nothing to do with his wife…Rather, he was the remigrant. His family, who lives in Florida, is planning to visit the country later this year. His business holdings overseas were the reason for him to be traveling so much. The businessman was never contacted by GRA after he brought his Mercedes Benz AMG SUV. It was registered as PPP 9090 on November 2, 2012. Mangal said he was shocked after that Stabroek News article as he did not believe that anything wrong was done. He said he has been back four times this year, spending a few weeks at a time. Under the country’s regulations for the Remigrant Scheme, the applicant has to sign a statutory declaration, filed with the Ministry of Foreign Affairs that he/she is coming to live in Guyana for no less than three years. The applicant has to be living overseas for more than five years to be eligible to be classified as a remigrant. Once approved, the file is forwarded to GRA, where a letter is then issued that authorizes the foregoing of taxes. Under the regulations, the applicant is responsible for paying 10 and 30 percent taxes, depending on the engine size. Personal effects are totally free of taxes. A remigrant is required to keep the vehicles for three years, or face penalties of having to pay the prorated taxes. The applicant, once approved, is required to visit the offices of GRA every six months, with the vehicle, its registration and as well as the passport. GRA is supposed to examine the remigrant’s passport to determine how many times he/she would have travelled abroad and whether they spent more time out of Guyana, than in. If it is found that the remigrant spent more time overseas than in Guyana, then GRA is required to write the Ministry of Foreign Affairs, recommending that the remigrant status be revoked. This means that the remigrant will have to pay the required taxes. Last week, the Attorney General told Kaieteur News that Mangal owned 15 apartment complexes overseas and has invested heavily in Guyana.